Dr. Robert F Eaton, Sr. Celebrating the life of Dr. Robert F Eaton, Sr.
Be the first to share your favorite memory, photo or story of Dr. Robert. This memorial page is dedicated for family, friends and future generations to celebrate the life of their loved one. Obituary for Dr. Robert F Eaton, Sr.
Dr. Robert F. Eaton, Sr., a retired research chemist, died January 30th, 2019 at the Robert Wood Johnson University Barnabas Hospital in New Brunswick, NJ. The longtime Montgomery Township, NJ resident was 71. Bob, as he was known to family and friends, was born on April 4th, 1947 in Baltimore, MD to John Eaton and Mary Eaton (nee Piller) . 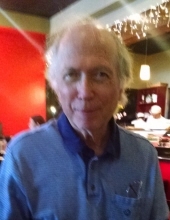 He attended Mount St. Joseph High School and Loyola College (now Loyola University Maryland), from which he graduated with a degree in chemistry in 1969. He was the recipient of the Chemistry Gold Medal for the class of 1969. He earned a PhD. in chemistry in 1974 from Princeton University, where he studied under Arthur Tobolsky, and for the next two years did post-doctoral research in polymer physics at the University of California, Berkeley. Bob then joined Union Carbide Corporation, now Dow-Dupont, where he worked for 36 years as a research chemist and manager at locations in and around Bound Brook, NJ. His areas of expertise included physical chemistry, polymer science, electric properties of polymers, and coatings technology. He has numerous publications to his credit and holds over 30 patents stemming from his research. Bob’s outside interests included amateur radio (callsign K3SFS) and model railroading. He spent his spare time building and repairing radios, antennas, audio equipment and other electronic gear. He also built and maintained a number of model railroad layouts in his home, teaching others about America’s transportation history. He stayed in shape by walking, biking, swimming, ice skating, and occasionally working at heights on his ham radio equipment. An avid fan of Baltimore sports teams, he followed the Orioles, the Baltimore Colts and, since 1996, the Baltimore Ravens. Bob is survived by his wife of 40 years, Gail, and his daughter, Caryn. He was predeceased by his son, Robert F. Eaton, Jr., in 2007. To send flowers or a remembrance gift to the family of Dr. Robert F Eaton, Sr., please visit our Tribute Store. "Email Address" would like to share the life celebration of Dr. Robert F Eaton, Sr.. Click on the "link" to go to share a favorite memory or leave a condolence message for the family.